Ariel Hudes, a Brown University student, contacted PublicAdCampaign about a month ago with a request. In her first email she wrote..
And for our final assignment "a final project that goes beyond the Brown campus"... my dream is to get it blown up... and go to ny and put it in a phone booth. Obviously we helped her out. She came down on the 13th and off we went with two posters in hand. I put up the first one just so she could see it happen, and then it was her turn. 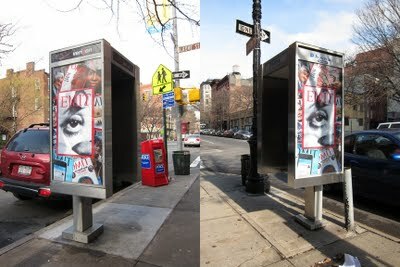 After her first phone booth install she had a grin from ear to ear and a sense of accomplishment that was palpable. Here at PublicAdCampaign we always enjoy facilitating peoples interaction with their public environment. We are also continually impressed with how empowered it makes people feel and how it changes their entire relationship to the streets around them. Congrats Ariel! (For me, I would wear a workman's uniform and an orange vest -- 'cuz i like COS play -- with my culture jams).